A separated bike lane on Seattle’s Fourth Avenue is coasting ahead in the newest transportation-agency plans. 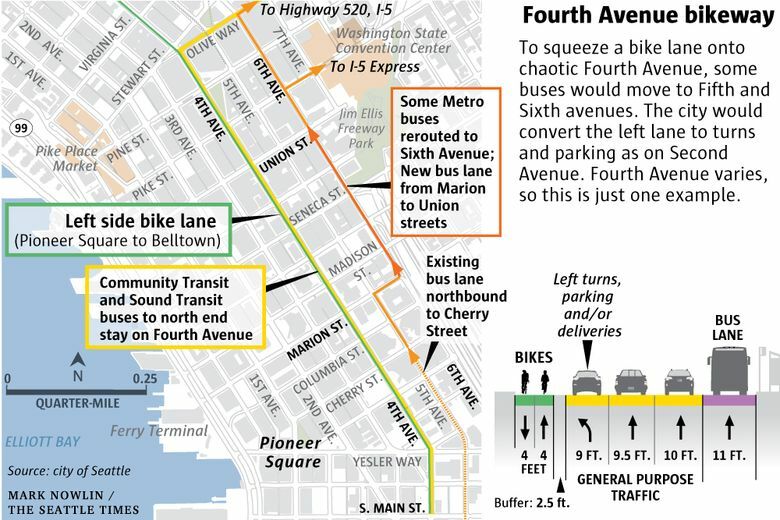 A two-way, low-speed bicycle lane, protected from other traffic, would be carved out of Fourth Avenue in downtown Seattle under new concepts revealed Thursday night by local transportation planners. The lane would be on the west side of the street, and planters, posts or curbs could divide bicycles from motorized traffic heading north. Currently, Fourth Avenue is a bicycle gantlet. A thin, striped lane near City Hall fades away near Westlake Park, where riders speed down the small hill and merge with cars, to the frustration of both drivers and cyclists. This new route, a piece of a broader “One Center City” plan to manage a pending traffic crisis, would resemble the existing Second Avenue bicycle lane. But how would the bikeway affect cars and buses? The left car lane would be a combination of curbside parking and left turns only, on a green arrow, like on Second, said Eric Tweit, a senior planner for the Seattle Department of Transportation. The city and King County Metro Transit earlier negotiated about whether to put a second bus lane on Fourth, to help meet growing demand. But they can’t shove both a bike lane and a second bus lane onto Fourth without ruining general traffic. So as an alternative, Metro would shift its Fourth Avenue buses to Fifth Avenue, where the northbound bus lane would be stretched a couple of blocks north — and then jog over to Sixth Avenue to continue north toward Interstate 5 entrances. Routes 74, 76, 77, 301, 308, 311 and 316 would make the shift. In the busiest hour, that change affects 28 buses between 4:30 and 5:30 p.m. weekdays. Community Transit and Sound Transit north-end commuter buses, which now carry about 15,000 daily riders, would stay on Fourth, where there would be three fewer bus stops overall. Buses would need to leapfrog each other less often, and presumably can do without a second bus lane, explained Tom Brennan, consultant with Portland-based Nelson Nygaard. Bus trips on Fourth are supposed to improve from 10 minutes to just under 9 minutes, a consultant chart predicts. There would still be three general traffic lanes in the widest stretch on Fourth, but turn locations would be restricted, said Brennan. That somewhat resembles Second Avenue, where a through-traffic lane was reduced to a peak-hours, left-turn-only lane to make room for bicycles. Automobile traffic on Fourth is already one lane shy near Westlake Park, where for many months the left curbside next to Macy’s has been occupied by a dumpster and contractor equipment. The ideas were presented Thursday night at a One Center City advisory group workshop at Sound Transit’s boardroom in Union Station. Tom Graff, of the Belltown Business Association, said his experience riding buses makes him wonder how realistic and uncomfortable for riders the shift would be — going uphill on Marion, then turning left at Sixth, while contending with pedestrian crossings and turning buses. “I want to make sure, and just not on paper, that they can do it in a reasonable time,” he said. In another change, Brennan said agencies are leaning toward an all-day ban on car through-way travel within the Third Avenue busway, which now forbids general traffic only from 6 to 9 a.m. and 3 to 6:30 p.m. Weekend and night driving there would likely continue, he said. Meanwhile, the Second Avenue bike lane is being extended this fall from Pike Street to Denny Way, and the city will start soon on bikeways on lower Pike and Pine streets west of Eighth Avenue. Projects like these would establish a basic, connected bike network, which has been touted by three mayors but long delayed. With more bike lanes and expansion of the new stationless rental-bike business, the city hopes cycle travel will triple by 2023. Agencies are striving to write the One Center City plan by early 2018 before the pace of downtown construction and related lane closures accelerates. Expansion of the Washington State Convention Center starts next year, forcing buses in the downtown tunnel to be removed sometime in 2019. The new Highway 99 tunnel opens, and the Alaskan Way Viaduct will be demolished. Jobs and housing continue to grow, but Sound Transit won’t be able to significantly boost light-rail capacity to frequent four-car, 600-person trains until 2021, when its Northgate extension opens. Brian Ferris, who invented the One Bus Away app, praised the unusually rapid planning process. “It feels like the city’s on fire, and this is a short time frame,” Ferris said. Some other members complained the agencies were pushing out plans too quickly without enough input.